This evening, we had another fun neighborhood family date night. This time around, it was at an outdoor local eatery. Hank's Dairy Bar. It's less than 5 minutes down the road from us. We've been planning this date night for a while now because our favorite local entertainer was performing 5-8 for open mic night. We all made plans to meet up at Hank's Dairy Bar, enjoy their great food, hunker down close to the stage, and enjoy each other's company and the music and vocals from Jonny Debit. Before I continue with that story, I want to give a shout out to Jonny Debit. We were lucky to stumble across him back in May of 2017. Lisa and I participated in a non-pet themed event. It was the first time...and the last. Like with most situations that don't go as planned, we make the best of it and leave with positive stuff we gained from the entire experience. 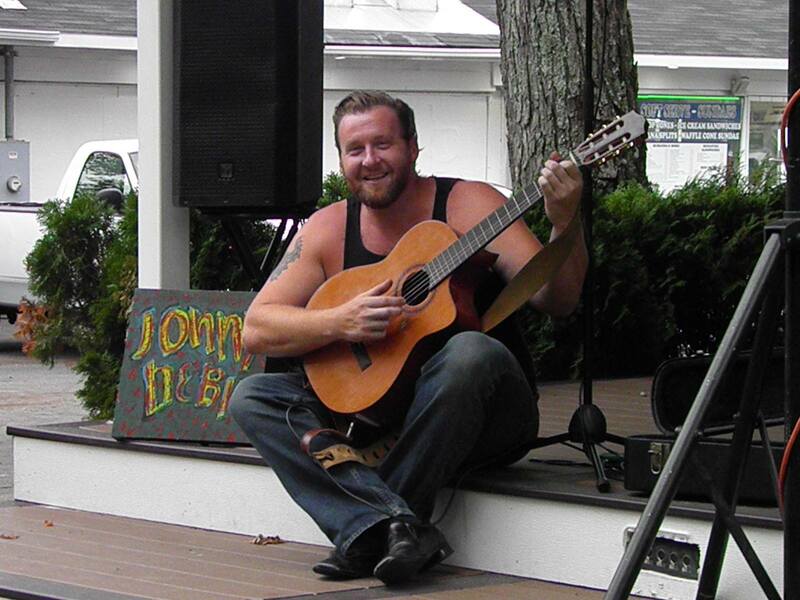 With that particular event, one of the positive experiences was hearing Jonny Debit. The following month when planning our Backyard Anniversary Party, the topic of live entertainment came up. That aspect was symbolic to us because at our wedding we hired a local artist, Justin Jaymes, to perform. I immediately thought of "the man at the event" the month prior. I reached out to one of the women who had coordinated the event. She gave me the name of "the man" who had performed. I found him on Facebook. Jonny Debit. I reached out to him. Within a relatively short period of time, we booked him to perform at our Backyard Anniversary Party. He made quite the impression. Everyone loved his music and voice. Earlier this year, when planning Lisa's 50th Birthday Bash, I reached out to Jonny. I wanted him to perform at the party. I held my breath. Was he going to be available? Jonny put on a spectacular performance for Lisa's 50th Birthday Bash. We included him in the festivities. He did 3 separate sets. Our guests were singing and dancing. Right around that time, we learned that Jonny was going to be playing at Jimmies in Preston a week or so after Lisa's party. Then, he was going to perform at Hank's Dairy Bar tonight. We planned a neighborhood date night for both evenings. We snagged a picnic table and set up our chairs close to the stage. Everyone enjoyed an incredible dinner. We talked. Laughed. Sang. Danced. The set up was awesome. Hank's Dairy Bar has a small stage. Jonny had set up his speakers and there was a drum set. The operative words are drum set. Lisa had her eye on the drum set all evening. She was itching to play the drums. At one point, she got up and danced and played the air drums with June's cane. We were all laughing and cheering her on. Lisa got up on the stage and sat at the drum set. That definitely got our neighborhood family hootin' and hollerin'. She played the drums during one of Jonny's songs. Unfortunately, my camera battery was almost dead so I didn't get decent photos, but I did manage to get the one shown at the beginning of this blog column. Then, she drummed a mini solo at the end of the song. I stood there wide-eyed. Mouth to the ground. Okay, so she's not Metallica status, but she held a tune. She got a standing ovation. And, the first thing I thought was, "She's a Dog Mom Gone Wild...."
It's the end of the Summer season. Our favorite outdoor eateries will be closing soon. No more outdoor open mic nights until next year. Today is the first day in 2 weeks that I've felt like my normal self. In addition, Lisa has been stressed and frazzled and overtired. I think we all needed tonight for various reasons.